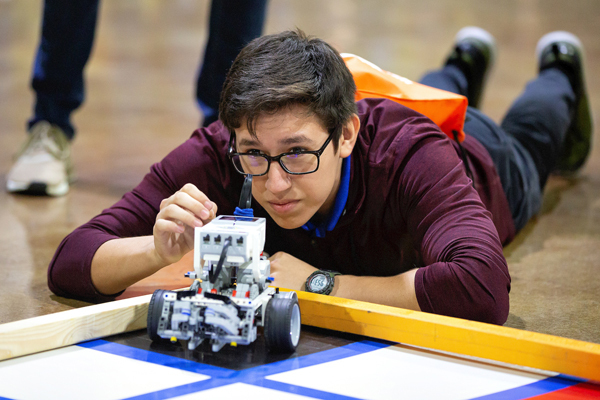 PHARR, TEXAS – More than 40 energy-filled middle and high school robotics teams from across the Rio Grande Valley competed in a quadrathon challenge at the Pharr Events Center to start off UTRGV’s annual Hispanic, Engineering, Science and Technology (HESTEC) Week. The Oct. 1 competition started at 9 a.m., as students from as far as Laredo pitted their robots against competing teams. Each of the 44 teams was in charge of building its own robot out of Lego® parts and programming it to compete in a number of competitions, including a maze, going up and down a ramp, and a search and rescue. There was a station available for the teams to test out their robots and make any necessary changes. Seventh-grade science teacher Danny Gonzalez, of Veterans Middle School in Donna, said the field of robotics is important to his students because they can see what they built, learn from their mistakes and make it better. “There’s a lot of building. They see how important the design is before, and then how is affects execution at the end. And it usually never turns out the way they think it’s going to turn out. So you have to go back, redesign, modify. Sometimes, it works out even better than anticipated. They’re constantly learning,” he said. The Warrior Bots, the team Gonzalez coaches, has its own accomplishments outside of HESTEC: They turned an electric wheelchair into a T-shirt launcher used for pep rallies at school. The team’s president is eighth-grader Melanie Salazar. Milton Hernandez, program coordinator with UTRGV’s Division of Governmental and Community Relations, was in charge of putting together Robotics Day. Along with his team, they are in charge of creating the competitions. He stressed the importance of HESTEC for the university, the community and area schools. “I’ll be walking around during competitions and I’ll see a school struggling, and I’ll see a different school from another city helping them out. I think it’s important, because it brings that family concept, but it also shows you the importance of STEM,” he said. Fernando Perales, an eighth-grader from Memorial Middle School in Edinburg, said his father inspired him to get involved with the robotics team. “My dad took me to his job and told me to take apart a motor. I tried it, and I was able to do it. I put it back together. I broke some parts, but I tried to fix it,” he said. HESTEC continues throughout the week, ending with Community Day on Oct. 6. For a full schedule of events visit www.utrgv.edu/HESTEC. Written by: admin on October 12, 2018.